It may sound a strange prospect to put down your telephoto lens in exchange for a wide-angle, but it could be one of the best things you have done for your photography. Whilst telephotos allow us to produce many beautiful images, it is nice to mix things up a little and show a variety of techniques we possess. In fact, shooting with a wide-angle is fast becoming one of my favorite things to do. It introduces a completely new level of impact on a photo and is extremely fun to do at the same time. It is important to remember the effect that a crop-sensor or a full frame camera has on the reach of your lens. I have a full frame sensor, and I use a Nikon 14mm f/2.8 lens . So, on a crop-sensor camera, that lens would be the equivalent of about 24mm on my camera (the crop factor is 1.5x for Nikon). You don’t need to go so ultra-wide, but I find it is the most fun because of the challenge. Some other wide-angle options include the Canon EF 14mm f/2.8L II USM and Nikon AF-S 14-24mm f/2.8 lenses. If those lenses are out of the budget, then take a look at this cheaper but highly regarded lens: the Sigma 10-20mm f/4-5.6 lens (only for crop-sensor cameras – available for Nikon, Canon, Sony & Pentax). The cheaper option for full-frame cameras is the Sigma 20mm f/1.8 EX DC lens. The main attraction for this type of photography is that you can achieve a much more one-to-one feeling with the subject in the image. Also, you are able to incorporate the animal’s surroundings into the photograph. This can greatly change the dynamic, making for an incredible photo. It goes without saying that animals tend not to like a camera being pointed in their faces, and if you try to do this they will probably run a mile. The key to using a wide-angle usually involves a remote release system. Wireless systems are the best, and they consist of two pieces. 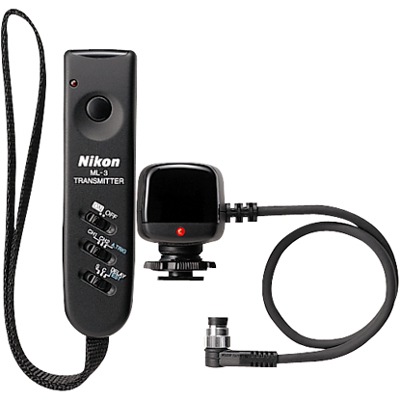 One attaches to the hot plate of your camera, hooking up to the electronics with a small cable that fits into the side of the camera. The other stays with you wherever you are hidden away. To take a shot, you simply press the button. There are other methods to using a wide-angle of course, including the use of infrared trips (favored for nocturnal animals) or even handholding, but that’s something for another tutorial! There are various types of remote release available on the market, and they all vary in price and quality too. Here is a quick rundown of the choices you have. This was the first remote release I used. It cost a fair amount at the time, and to be honest I was very disappointed (sorry Nikon). It worked via infrared signals and required direct line-of-sight between the receiver and the remote, which is not always possible. As a result, I often missed shots – an incredibly annoying thing to happen. If you’re using it as an IR trip, however, then it is more useful. Canon has their own release called the Canon LC-5, however, I have never used it and haven’t heard any opinions on it either. Some people prefer to stay within their own brand, so there’s no harm in giving it a whirl if this is you. It’s also very pricey! I have heard many positive reports about Pocket Wizard. It’s a third-party make and works for many different brands of camera. The quality is very good, and they work on a radio signal meaning you don’t need line-of-sight. I believe they are built more for those using many flash units, as the systems are advanced with many different options. It would be overkill to buy one solely for just releasing the shutter. Personally, I switched from the Nikon release to an obscure Chinese brand’s version: YongNuo. It’s a lot cheaper and works amazingly well. It works on a radio signal too and has a reported range of 100 meters. Even though it is tagged with the stigma of “made in China”, it’s an impressive little piece of kit and very simple to use. They’re my personal recommendation, especially if you are trying out wide-angle wildlife photography for the first time. They are available on Amazon at this link – make sure you find the correct one for your camera in the search listing. Being away from the camera body itself means that changing the settings is pretty much impossible. There are some expensive components you can buy to allow this, but there isn’t a huge amount of need most of the time. Put your camera into aperture priority mode, if you aren’t in it already you probably should be, and expose for the conditions that are current when you set up. If the lighting changes a little, your camera should be able to cope and adjust itself now. Use a smaller aperture of about f/8 so that you have sufficient depth of field. If the lighting conditions are favorable, you can go smaller. Remember, the smaller the aperture, the more of the surrounding environment will be in focus. Make sure to set the focus manually, otherwise, the camera will “search” for the focus (and probably make a mess of it too). Estimate where an animal will sit, and use the focus ring to achieve proper focus. Remember to pop the camera (or lens) into manual mode too, otherwise, it will just refocus itself. Find an area where you want to put the camera, and use whatever materials you can to prop it up. Ensure to keep it level so that your horizon is perfectly horizontal, otherwise, you’ll ruin the image. You can straighten images in post-production, but you don’t want to have to do this a lot as it crops photos. Make sure your remote is pointing the correct way if it requires line-of-sight, and then sit in a nearby hide and wait. I’ve said it in other articles: animals are suckers for food. This method will only be suitable for some animals. Find out the favorite (and healthy) treat of your subject, and lure it into position by placing some underneath or near the camera. Please make sure you’re using healthy and approved foods(e.g. no salted or roasted peanuts!). You’ll have to get them used to this first so that they know to look around the camera. The feeding method will work best if you have a feeding station set up already. If you don’t have a feeding station, but know the regular pathways that animals take in an area, set up the camera where you think they will cross. Then hide away (probably at a fair distance downwind so they don’t smell you, as they likely won’t be used to you) and wait to press the shutter release. The shutter of your camera is loud, so it will take time for animals to get used to it. As they approach, release the shutter for one frame. They’ll maybe run off nervously, but will be back. For me, it took one “test” shot like this until the squirrels were perfectly happy to sit having their image snapped. This will likely take a lot of time and practice to perfect, so don’t give up at the first hurdle. It took me a while to start getting usable images that I was proud of. Even so, it’s endless fun – and you never know what you’ve taken until you go and pick up the camera. I think that’s probably one of the best bits! 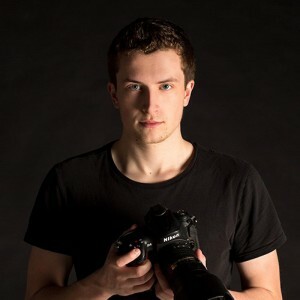 Will Nicholls is the founder of Nature TTL and a professional wildlife photographer and film-maker from England. Having been photographing since the age of 12, Will’s images have won a string of awards, including the title of “Young British Wildlife Photographer of the Year” in 2009 from the British Wildlife Photography Awards. 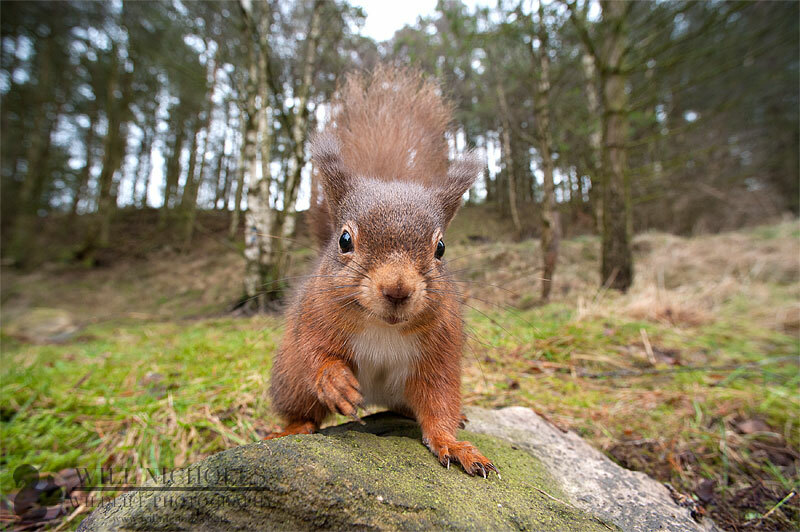 Will is also the author of the book On the Trail of Red Squirrels . Backyard Photography is for the Birds!